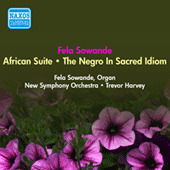 the "1946 Theatre Organ World publication"
"Fela Sowande is undoubtedly the father of modern Nigerian Art Music and perhaps the most distinguished and internationally known African composer of works in the European classical idiom, his works mark the beginning of an era of modern Nigerian Art Music." During the past two years, new facts and photos of the performances of Fela Sowande in London have come to our attention from Alan Ashton, as related at the website. Audio clips in mp3 format have also been provided by Mr. Ashton and added to the Sowande page. Fela Sowande spent the final years of his teaching career at Kent State University in Ohio, the state in which he died in 1987. 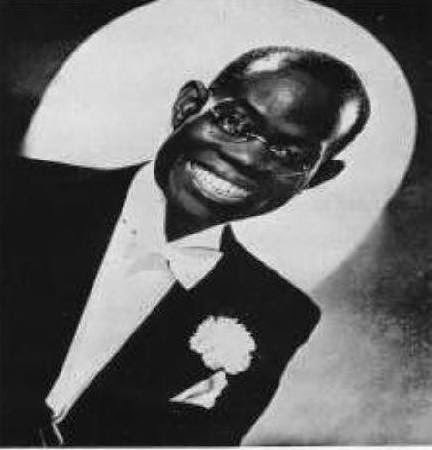 African Suite has become widely known through radio broadcasts in the U.K. and Canada, and through a Decca LP and a CBC CD. The work is currently available in mp3 format from Naxos, as pictured above.